I must admit, dear reader, that I had reached a point where unanticipated revelations no longer had a surprising effect. A couple of weeks prior, I would have easily jumped back three yards in a north-east direction at the news that Madison’s love interest was Pietro Ducale. The idea that Madison was attracted to a man whose sentences had paragraph-length life expectancies might even have triggered a “What ho!” Alas, Manhattan life had rendered me immune to much of life’s inconsistencies. Of course, when it comes to my insouciance, it did not begin to match Ypres’s. In the end, history will record that with Ducale planted as immobile and impenetrable as a Secretary-General’s report, I issued a flat “is that so”. Beaconsfield-Outremont, as any good Canadian sensing an uncomfortable scene, mumbled a sorry and exited stage right. I was left with a wildly blinking Madison, and a Ducale whose look suggested he was searching for a preamble with appropriate footnotes. I readied myself, expecting a corollary to the Geneva Conventions. Finally, appropriating the look of Talleyrand about to bamboozle a sceptical Metternich, he began. Madison beamed at Ducale. I was afraid she might burst into spontaneous song. Meanwhile, I was still waiting for the Vasa mind to translate Ducale’s chapeau, as I believe Ypres’s friend Lord Mansfield would put it, into everyday English. The good old bean’s processors throbbed at full capacity. Sensing my perplexity, Ducale continued. And with those words he seamlessly departed, giving a brief smile to Madison. “Isn’t he dreamy?” Madison attempted in C minor. At the moment, all I could think was that Madison was in love with a man who could not swim. And his not being able to swim had left me in the position of pushing Madame LaPeine de Mort into a lake, and drafted Cousin Andrew into the affair. Not only could Ducale not swim, but his principal qualification was his ability to leave his interlocutors drowning in a sea of endless phrases. And I, in my capacity of conundrum consultant, and out of an innate duty for kindness (for I am the incarnation of kindness), had devoted my spare time helping this romance along. I did not know what to feel. Luckily, providence had made me British so I could choose to feel nothing. This I did. As I thought it over on the subway ride home, an unidentified moist object jabbing me in the back of my right knee, I concluded that by helping Ella and Madison be who and with whom they wanted to be, I was actually a feminist activist. Surely I was more of a feminist than those Greenwich Village dwellers who wear pink t-shirts with “feminist” scrawled across their chest. Having negotiated my way into the building while the doorman was distracted, I shared my sentiment with Ypres. I briefed Ypres on the process of my reasoning, nay, my deduction, so far. I told Ypres that what had prompted it all was the revelation that Pietro Ducale, not Beaconsfield-Outremont, was Madison’s lover. And that my observation, the one backed by Cousin Andrew and her that led to my deduction, was wrong. Ypres greeted the news with no sign of life, at least not life as seen on land. Her aquatic eyes could only just be glimpsed through her heavy eyelids. Finally, in true postgraduate fashion, she answered my question with a question. Ypres gave her trademark two millimetre smile. I drummed my fingers on the armrest. Barely had I finished my sentence on finishing, that the doorbell rang with the violence of an American police arrest. My reflexes had returned as I unexpectedly jumped. My jump turned into a leap when from behind the flat door came a “Vanessa, it’s me!” screeched at Brünnhilde volume. Ypres opened the door to reveal a Madison contorted in Wagnerian distress. 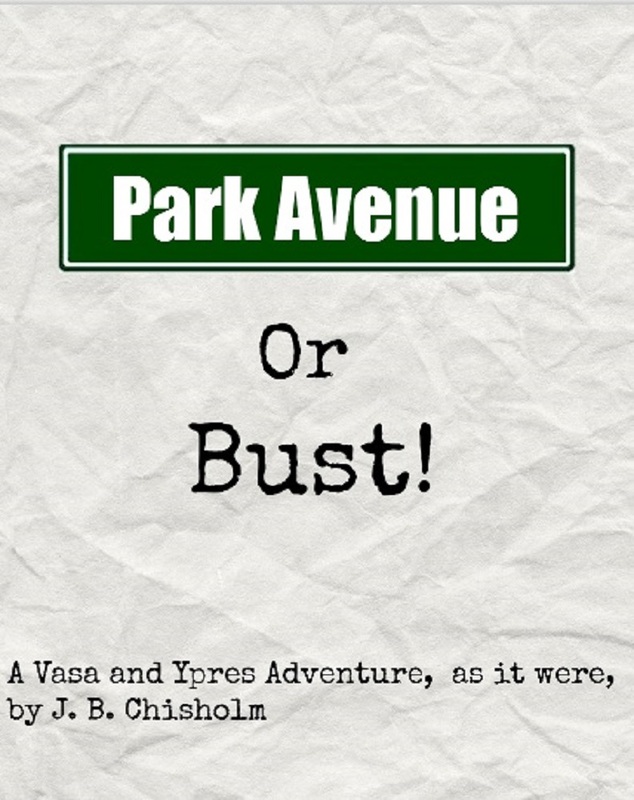 Vasa and Ypres’s first full-length adventure, Vasa and Ypres: A Mayfair Conundrum, is available on Amazon. If you enjoy Vasa and Ypres, please share on social media. Vasa and Ypres is on Twitter. You can also join over 1910 WordPress followers. Oh my God: what’s happened to Madison? And to think – I’ll have to wait an entire week to find out! Typos? Second ‘Jumped’ didn’t require the ‘ed’. Still trying to get caught up on your earlier stories, but I do so like the way you write. Thank you! The typo has been corrected.